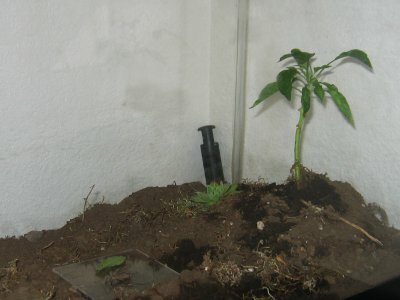 You can see the little pepper plant that didn't thrive so well in my window sill in there, as well as the square of Plexiglas that I pretty much use as a sacrificial altar; I put dead bugs on there, and the ants come out at night and haul the bounty away to eat. So, I've had a question in my head for a few days about their eating tactics. The hole from which the ants come out (I've only noticed one hole) is small. 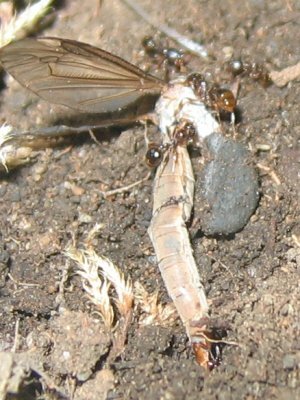 It's only big enough for a couple ants to get in and out of at a time, so when the ants are carrying off the carcass of a crane-fly, I've wondered how they got the crane-fly into their tunnels. 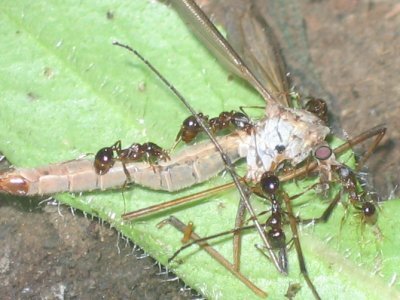 Here are the ants, carrying off the latest crane-fly. 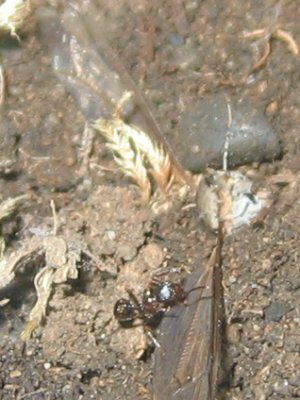 This is typical, and you can see in this picture just how large the crane-fly is compared to the ants. 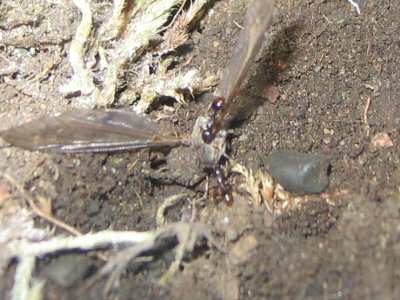 And here are two pictures of the ants bringing the crane-fly into their tunnel. It's hard to tell, but if you look at the tail end of the crane-fly, you can see it heading down into the hole. It turns out that the tunnel is just wide enough to bring the length of the body into it. All the way in. And since the crane-fly head is wider than the body, the head gets stuck like a cork in the tunnel opening. 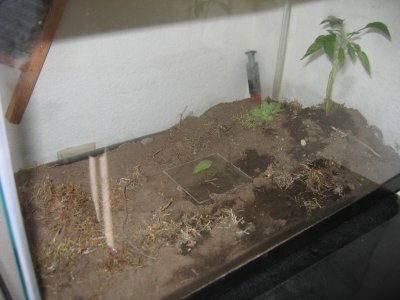 Now, I couldn't see what was going on in the tunnel at this point, because I don't have a "traditional" ant farm with narrow walls so I can see the ants digging their tunnels. That's ok, because I really enjoy having the ants live in a more natural habitat. They seem to be reproducing much quicker (I've seen a lot more of them going out on their hunting expeditions), and I just feel like they're less stressed this way. Yes. That's just the head and wings. 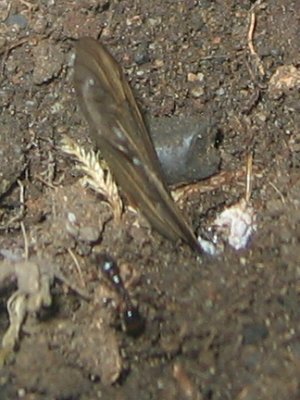 The ants apparently separated the body from the head, and continued to drag the body through their tunnel system, which resulted in the head and wings popping off. 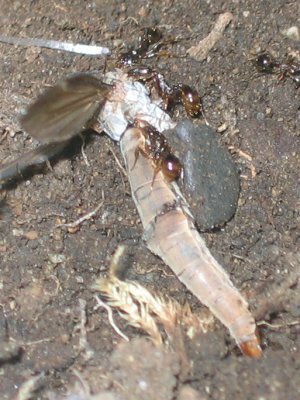 After chewing bits off the crane-fly's head off (to make it small enough to fit into the hole), they dragged the head and wings into their tunnel.